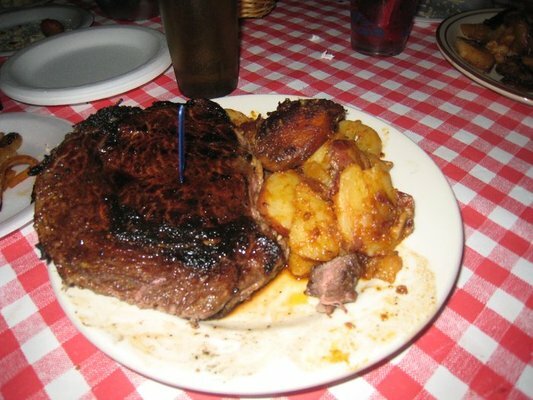 Sometimes when a guy orders a steak, it's not about the quality, but the quantity. You'll find plenty of quality in Manhattan (Sparks, Old Homestead, Keen's, to name a few) and Williamsburg (the steak mecca known as Peter Luger). But if you want quantity at a good value, you'll have to cross the river to get to Arthur's Tavern on Washington Street in Hoboken, NJ. No one ever confused Arthur's fatty sirloin cuts with Spark's chiseled sirloin, but the former has become a cult favorite among metropolitan steak fans nonetheless. You can get a 24oz sirloin for $24, and if you're brave enough, there's a 48oz sirloin for about $45. They're really good steaks for that price point, considering you would pay twice as much in the city. The steaks come with home fries, and the meat is charred on the outside and pink or red in the middle, depending on how you like it. Value has to count for something in the steak world.